Kings, queens, presidents, shahs, and popes have all owned Moser’s stemware at one time or another, giving it the nickname “The Glass of Kings.” Even the famed pianist Liberace owned a set of glass copied from Queen Elizabeth's own Moser pattern, and it was displayed in the Liberace Museum in Las Vegas, Nevada prior to its closing. This glass was not only beautiful and popular with the aristocracy, according to the company's website, it was also innovative since it was produced without using lead. The potash-lime used for Moser’s glass production was perfect for intricate engraving and also more friendly to the environment than lead crystal. Yes, that was a concern even more than a century ago when this type of glass was first made. The result was a beautiful, superior product in an array of colors. The founder of the company that produced this gorgeous glass, Ludwig Moser, opened the first of three factories in Karlsbad, Czechoslovakia in 1857. Schroeder’s Antiques Price Guide (now out of print) states that the styles developed there were entirely his own. There’s no evidence that Moser ever copied other artists, which is quite impressive considering the intricate and lovely work decorating his glass. Some of the original designs created by Moser include grapes with trailing vines, acorns with oak leaves, and flower gardens with butterflies applied in gold. Sometimes faux jewels were added to the designs to make Moser’s wares even more opulent, if not decadent, in appearance. Moser also used the same type of enameling, only without the gold leaf covering it, in a number of pleasing patterns to decorate glass in a vast array of colors. 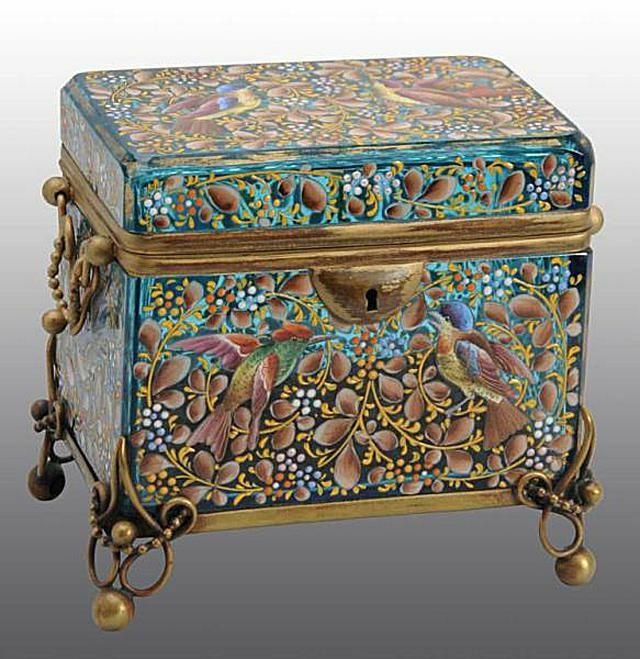 His enameled animal scenes display careful attention to detail and feature birds in flight, stalking tigers and stately elephants, among other themes. These, decorated similarly to the example shown here, can be quite hard to find today and are prized by ardent Moser glass collectors. Pappa Moser died in 1916, but his sons kept the company going after his death. The boys had been personally trained by their father to carry on the family business. Moser Glassworks is still working in Karlsbad, West Czech Republic. You can see some of their modern pieces available for purchase, including fine stemware and other drinking vessels, on the company's website at moser-glass.com. When shopping for older Moser glass, many experts suggest looking for superior clarity in the glass. This includes deeply carved and continuous engravings. The coloration will also be perfect, and hand enameling (often covered with gold leaf) with being finely applied and of the utmost quality. Moser glass will also have a nicely-polished pontil on the bottom of the piece. As a side note, in case you didn’t know, a pontil is the area where a glass blowers tool was attached to the bottom of the piece while it was being blown. Higher quality glass usually has a more finely finished pontil. All Moser glass was, and still is, finely mouth blown. Most older Moser pieces are not marked, but there are some exceptions. When present, they can be very faintly etched so look carefully when examining these pieces to avoid overlooking a mark amid intricate enameling or applied gold decor. Older marked Moser items do carry clout and are worth more in collecting circles in comparison to unmarked pieces. Also, keep in mind that many types of older glass look similar to Moser pieces. Upon close examination, however, but they don’t have the same high quality in comparison. Before you pay a high price for what is represented as Moser, make sure you look it over carefully and seek the help of a glassware expert if you’re not sure. Asking questions and confirming return policies in case a seller has made a faux pas in identifying this type of glass via online sales is imperative as well.